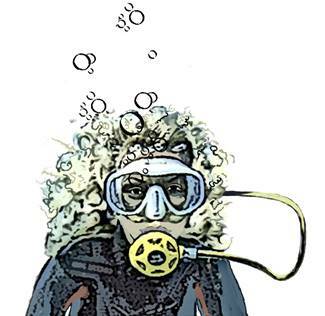 Title image: Pamela George in her own illustration as a diver. Pamela George brings three firsts to our Five Questions series. First, she is a children’s book author. Second, she is her own illustrator. Third, she is an environmental artist. We are delighted that she is willing to share her experience of making her charming children’s book Little Turtle and Baby Ray. Pamela George: How does your background shape your work? As an environmental artist I feel beckoned to paint and write about fragile and imperiled environments while they still exist. This commitment has taken me to the virgin rain forests of Papua New Guinea, jeopardized orangutan habitats in Borneo, and island territories in the U.S. and abroad threatened by sea-level rise. My “day job” for the past four decades was as an Educational Psychology professor. Most recently I’ve taught at Duke University in the Nicholas School of the Environment. Previously I taught at the NCCU School of Education. For me, inspiring and training students to “save the planet” was more than hope. 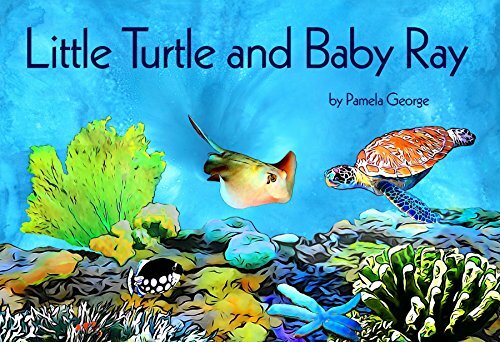 Pamela George: What was the inspiration for your recent Little Turtle and Baby Ray book? I have explored the undersea world as a diver for 50 years. 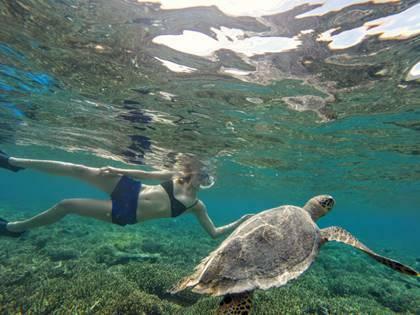 I fell in love with tropical lagoons and reefs living in Samoa as a Peace Corps volunteer. In a village with no electricity or running water, we teachers kept alive critters for our classrooms. We put octopus, eel, nudibranch and lion fish in aquariums and changed them out often. I even had a pet hawksbill turtle that lived in a spring pool near my house. I have dived in the Maldives, the South Pacific, Southeast Asia and the Caribbean over many years. My most recent dive in Turks and Cacaos was alarming. It once had lovely reefs and remarkable marine life. My sadness over the degradation of these reefs parallels news of massive reef die-offs in the Caribbean. 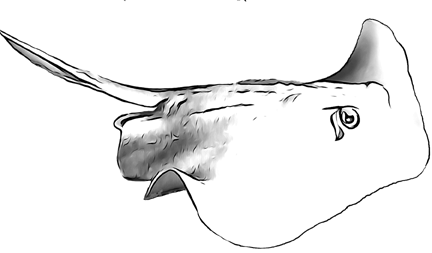 It has lost 80% of its living corals. The Great Barrier Reef has lost 50% of its corals since 2016 alone. 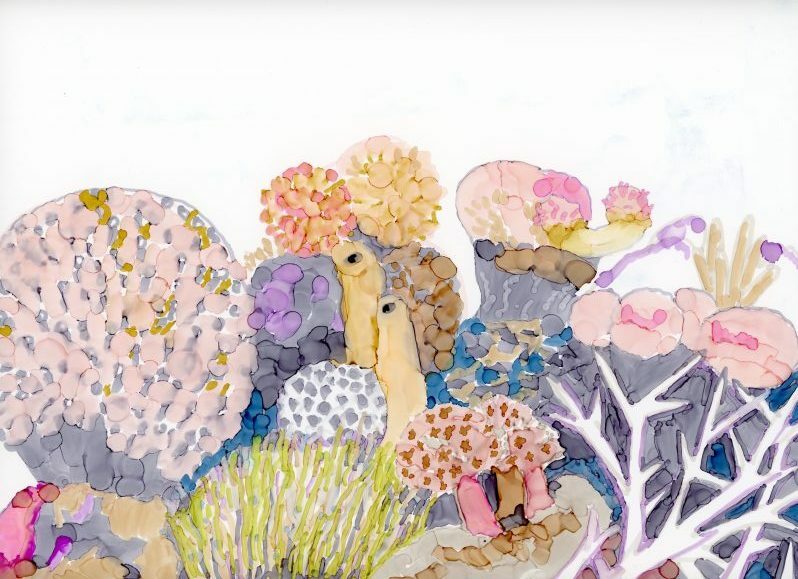 During the last decade as a professor in the Nicholas School of the Environment at Duke, I pledged my work as an artist to focus on imperiled environments, like these reefs. To that end, this Little Turtle and Baby Ray book is intended to inspire little naturalists to care about reef life and the sea creatures it supports. 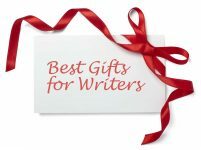 Pamela George: In your work do story or illustrations come first? What is your process? I am an artist before I am an author, and I wish that every book were illustrated. In my books I start with images. For color and size and conformation in this book, I used many reference photos. These came from dives that I and my family had made using a simple single-lens reflex GoPro underwater camera. I chose alcohol inks to paint most of the fluid background seas and colorful reefscapes. As example of a simple “garden” of corals and tubes before it became an illustration is seen below. Because alcohol inks are very fugitive, I scanned these paintings to eventually become the digital canvases for the painted story. For the critters, I often drew them using a Bamboo Wacom, a kind of digital calligraphy brush. It allowed me to move, skew, distort, and rework them for various applications. 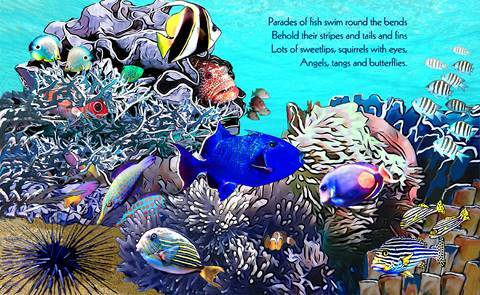 I then built up layer-upon-layer to create the rich, multi-faceted nature of this undersea world. Some illustrations had as many as 82 layers. Pamela George: What has it been like publishing children’s fiction? Carolina Wren Press published my last children book, The North Carolina Alphabet. It is a fine, established press, yet much of the book’s marketing responsibilities fell on me, the author. And all of the sales were put into that press’s future projects. 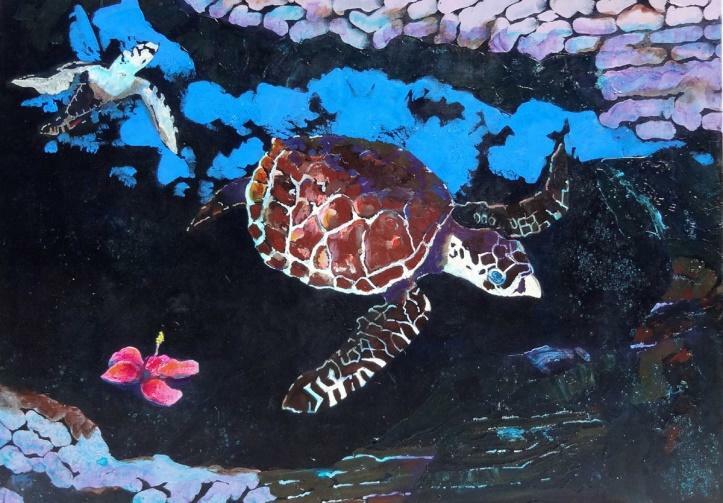 For Little Turtle and Baby Ray I wanted all proceeds from the sales to go to reef conservation. 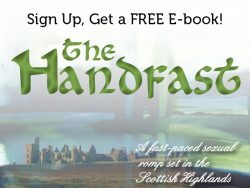 So I decided to pursue two routes: ebook and print. I published the ebook version with Amazon for Kindle and iPad. It is available for $2.99. For several weeks it was #1 Turtle Book on Amazon. Now that’s an accolade I never dreamed of! For the print version a talented local shop printed it, and P’Gale Fine Art Studio published it. I priced it at $10. The print version is sold from my studio, in local book stores, museum and aquariums, and on Amazon. 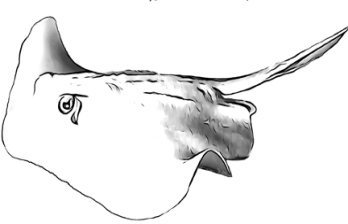 (I will mention that Amazon does not have reef preservation as a concern.) All proceeds beyond printing costs go to The Nature Conservancy‘s Reef Resilience Network to protect the world’s reefs.